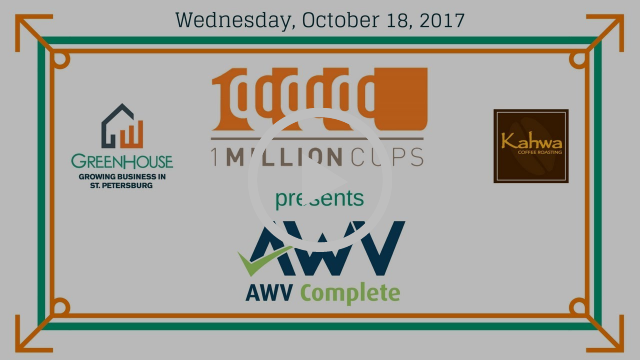 This week, our second #1MCstp presenter was Kate Chamberlin, President of AWV Complete. 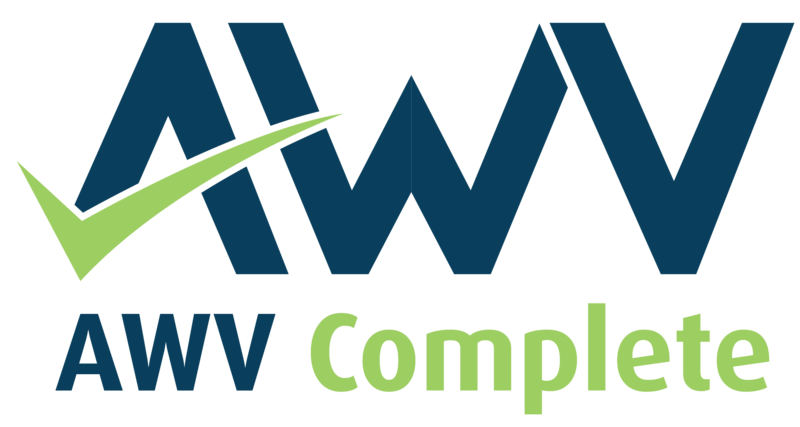 AWV Complete simplifies and automates Medicare’s Annual Wellness Visits to increase patient care and profits. 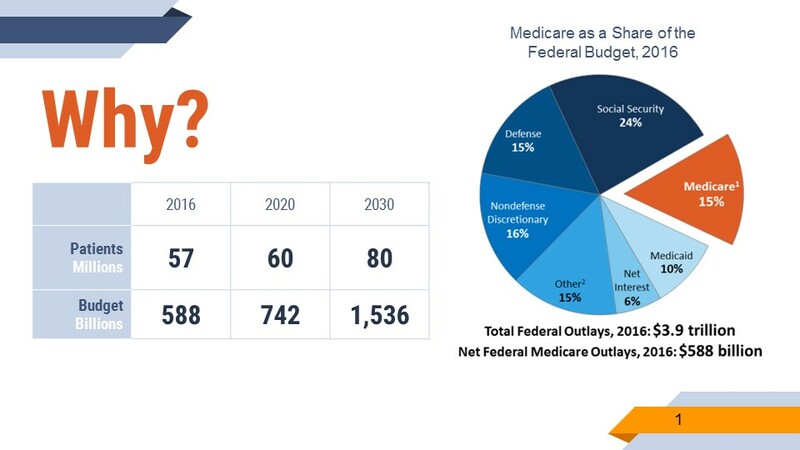 With 57 million patients on Medicare in 2016, the federal budget was $588B. That number is expected to increase to 80 million patients by 2030, at a cost of $1,536B. The Affordable Health Care Act of 2010 instituted a number of changes including the use of Annual Wellness Visits (AWVs) as a way to increase prevention and reduce future costs. The Annual Wellenss Visit covers three areas: Preventative Services, Health Risks and Lifestyle, and Untreated Conditions. Preventative Services include vaccinations, “like your flu shot,” Kate explained. “The second area, Lifestyle, addresses questions like, “What do you eat? Do you exercise? and Do you smoke?” The last area, Untreated Conditions, “gives the patient the opportunity to report any concerns” or bring up any health issues that haven’t been addressed.Normally, these Annual Wellness Visits are completed in a 3-part process. Patient data is collected, including all the information about Preventative Services, Lifestyle, and Untreated Conditions. Next, it has to be determined that the patient is eligible and which services they qualify for; for example, if a patient doesn’t smoke, they won’t be eligible for a smoking cessation program. Finally, after the visit, the doctor’s office has to provide a personalized report to give to the patient. This covers all the questions asked, the answers that were given, and individual recommendations on what to do next. The benefits of the Annual Wellness Visit are numerous. Patients benefit from the “delay, detection, and prevention of serious illness.” It also encourages return visits and a prevention mindset. “You get them think about prevention and what they can do,” Kate said. In addition, the customized plan gives specific information about what services can be utilized; the majority of these had copays removed by Congress, making it an affordable solution to health concerns. These improved patient outcomes also benefit doctors; “this is what the doctors are trying to do – that’s why they practice medicine.” The detail and optimization that goes into the Annual Wellness Visit also allows for more focused follow-up visits, which helps save doctors’ time. Lastly, doctors have increased profits, “now that we don’t have to compete for more money out of the budget,” Kate said. Unfortunately, less than 18% of individuals on Medicare had an Annual Wellness Visit in 2016, with 47 million people failing to take advantage of this opportunity. Why? 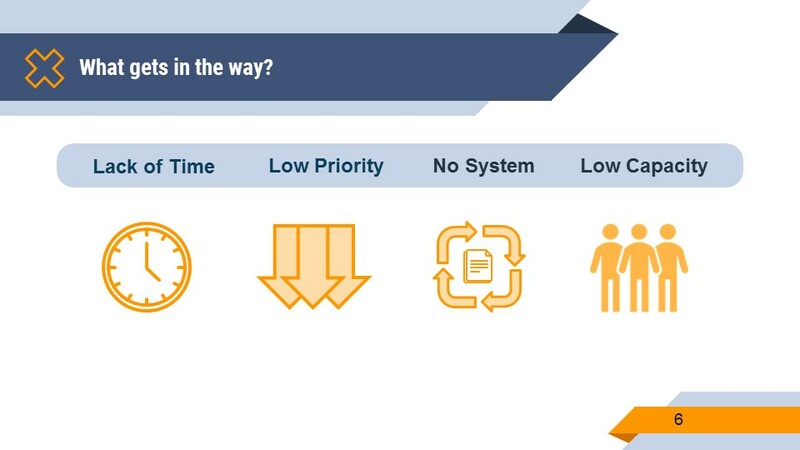 There are numerous obstacles, such as a lack of time, low priority, no system, and low capacity. “So our solution is we took the process I told you about and we automated it,” Kate said. 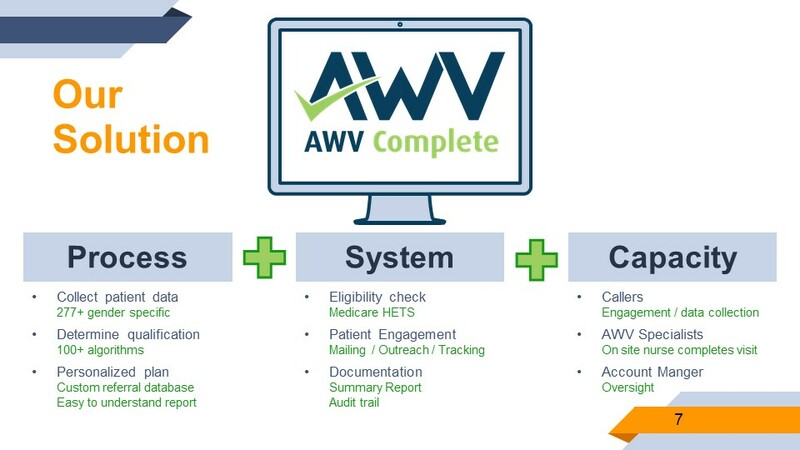 AWV Complete collects patient data directly in their software. 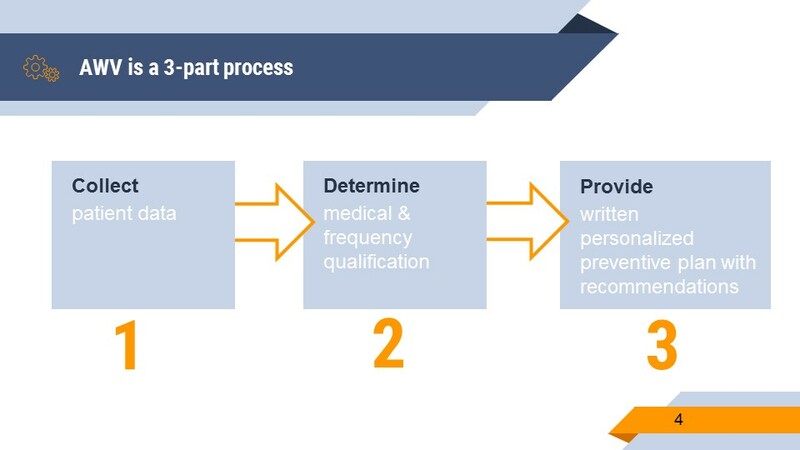 Then, the system uses numerous algorithms to determine eligibility. “We cannot – as a company – practice medicine. So what happens if a patient needs a flu shot? Well, we have a custom database, so the doctor can decide ahead of time if they want the patient to come back or go to a local pharmacist.” The AWV Complete software also assist with documentation output, helping create a report for the patient, “so they can easily understand what the next steps are,” Kate said. 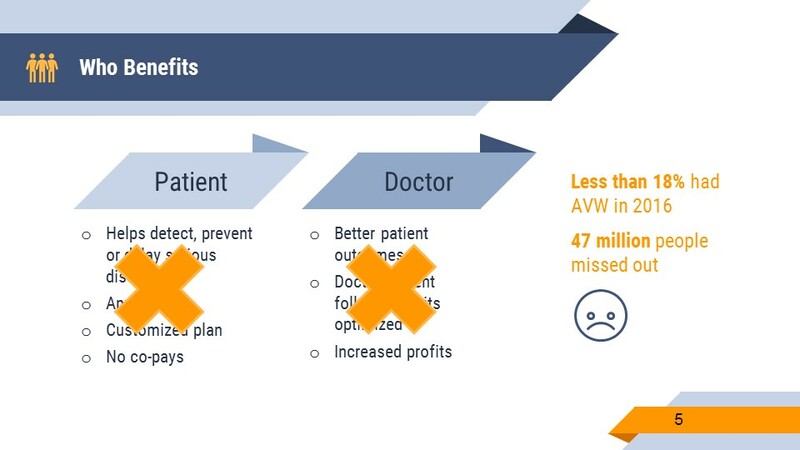 AWV Complete also helps increase capacity by taking the burden off doctors and nurses and supplementing it with callers to collect data and engage the patient, on-site nurses to complete the visit, and account managers to make sure everything is completed properly. 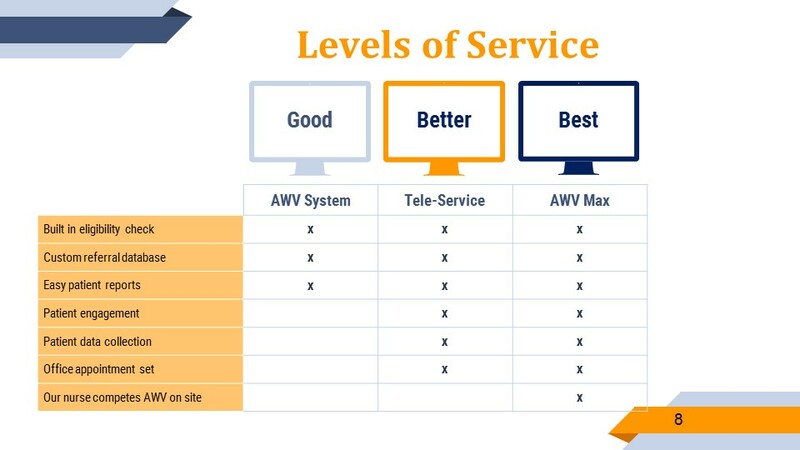 AWV Complete offers their services in three different tiers: Software as a Service (SaaS), Tele-Service that includes calling and engagement, and full-service, turn-key Wellness Visits with AWV Max. 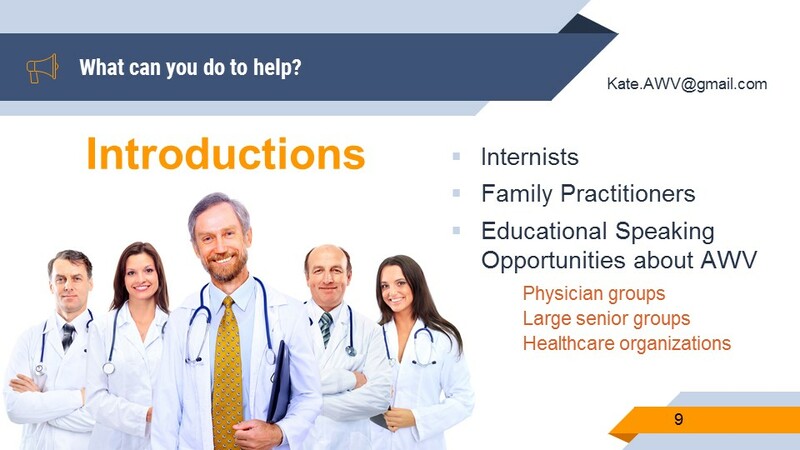 The company recently signed up 80 doctors and have begun to engage larger firms with multiple practitioners. Kate said that we can help by extending introductions. “If you happen to know any internists or family practices,” please help Kate connect with them. In addition, she’s open to talking with physician’s groups or other larger centers. 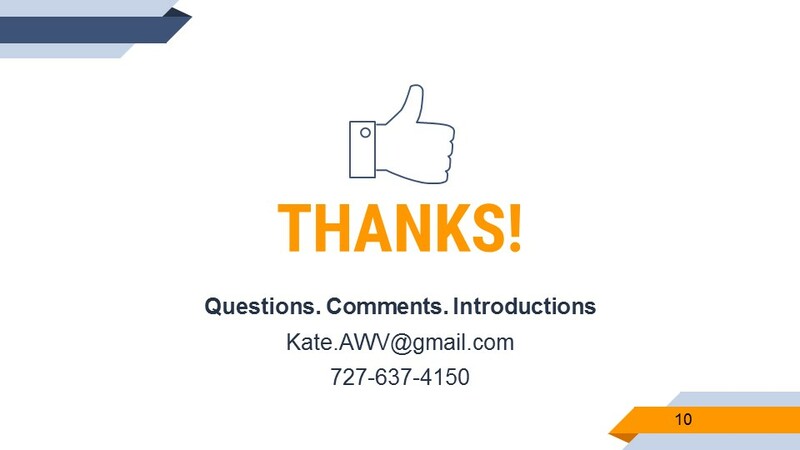 If you would like to connect with Kate, she can be contacted at or Kate.AWV@gmail.com or (727) 637-4150.